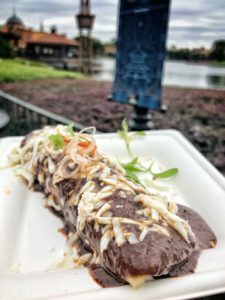 Speaking of happy surprises, we also recently checked out the full menu at Mexico’s Las Posadas Holiday Kitchen at Epcot’s International Festival of the Holidays and it was excellent!! 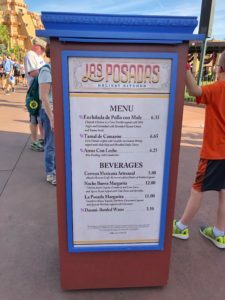 You’ll find the Las Posadas Holiday Kitchen across from the Mexico Pavilion in World Showcase. 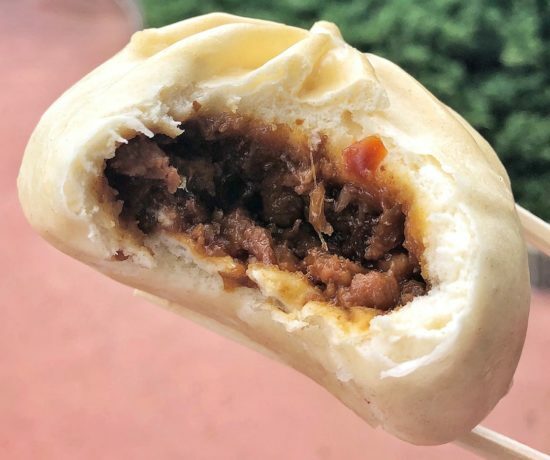 This season they offer three food items – two savory, one sweet – along with a number of drinks. If you can handle a little heat, don’t miss this gorgeous enchilada. 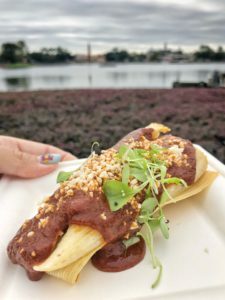 It’s packed with flavor and punch, stuffed with pulled chicken, covered in mole and cheese and really one of the best things I’ve had at a Mexico kitchen at an Epcot festival. Also not a bad value at $6.35 given how loaded it is with protein. 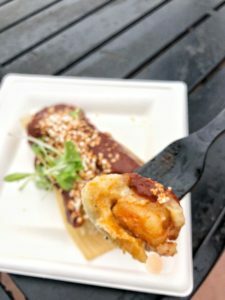 If you love tamales and shrimp and can handle a good amount of heat, you’ll dig this. 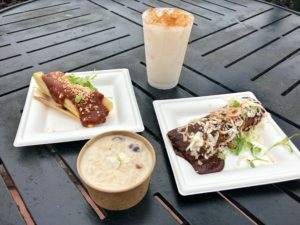 It came in second to the enchilada for me, but that’s largely just a matter of personal preference – and the fact that it was honestly just a little too spicy for me. 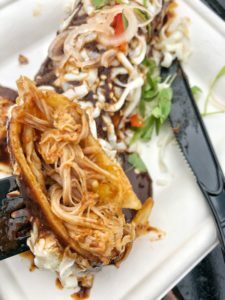 The mole is hot but packed with flavor, the marinated shrimp are pretty generously packed inside, and the cotija cheese was a great choice to sprinkle on top. Take note, Feast of the Three Kings. 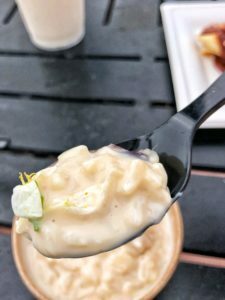 This is how you do a rice pudding. While I would have chosen something other than a white flower for presentation purposes (can you even see it in the picture??) this is so light and sweet and delicate. The brown paper bowl that it’s served in is sort of…rustic chic. 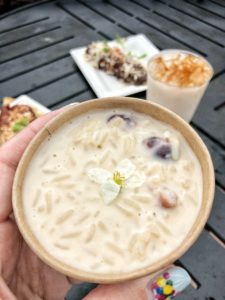 And the cranberries are huge and sweet – to the point that until I reread the description I assumed that they were dried cherries. This is simple and good. It’s no Yukon Maple Bûche de Noël. But it’s good. Holy. Rich. Drink. 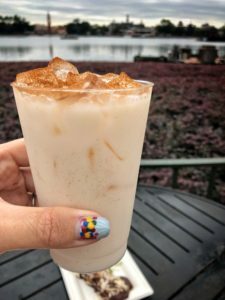 Have you ever had a Cinnamon Toast Crunch (Fireball & Rumchata)? This thing tastes like the love child of one of those and a margarita. Like someone was sipping Fireball (or I guess Horchata, actually) and thought: “You know what this needs? Tequila.” Don’t get me wrong. It’s delicious. But it’s not a drink to chug quickly. Prepare to nurse this thing around the rest of World Showcase. I’m likely to be back. After all, there’s a margarita on this menu that I haven’t had. But for now? 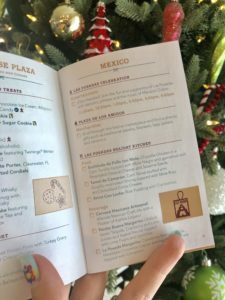 Las Posadas Holiday Kitchen? Check!